Bilal Daoud Saifi, 26, is being denied medication for his chronic medical condition in retaliation for his participation in the hunger strike. He has been held in administrative detention since 28 February 2015 and his detention was renewed on 28 August 2015. He has been repeatedly arrested and detained for a total of five years. All of the strikers are being held in solitary confinement in prisons and not provided with hospital care despite the 5 original strikers now having been on hunger strike for 25 days. 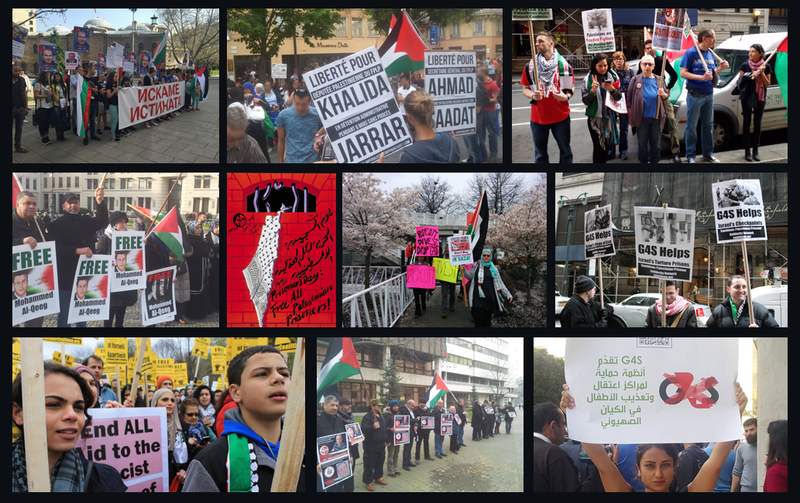 Organizing and events in Palestine in solidarity with the strikers have escalated. In Dheisheh refugee camp near Bethlehem, where four of the strikers – Palestinian refugees denied their right to return – are residents, a permanent solidarity tent has been set up at the entrance to the camp. Every day the tent is full of supporters, including youth performing street theatre and leading a night march through the camp. In Nablus and Al-Khalil, large rallies were held in solidarity with the striking prisoners and rallies are planned in Tulkarem and Gaza City for Monday and Tuesday. The Progressive Student Action Front at Bethlehem University organized a vigil to support the prisoners’ strike, distributing salt and water to students to inform them about the strike and the situation of the prisoners. Palestinian prisoners on hunger strike consume only salt and water. The PSAF at An-Najah University in Nablus also held an event to support the prisoners, distributing water and salt to students and speaking about the prisoners and their struggle. There are approximately 480 Palestinian prisoners currently held without trial under administrative detention, in which Israeli military court orders detention periods of one to six months on the basis of “secret files,” not accessible by detainees or their lawyers. These detention periods are indefinitely renewable. Administrative detention was initially introduced in Palestine by the British colonial mandate. Its use as a policy by the Israeli state contravenes the Geneva Conventions and the International Covenant on Civil and Political Rights. Palestinian prisoners like Khader Adnan and Mohammed Allan have gone on lengthy hunger strikes to win their release from administrative detention, and ending it is a long-time demand of the Palestinian prisoners’ movement. Samidoun Palestinian Prisoner Solidarity Network expresses its strongest solidarity with the striking prisoners, and calls for international actions, mobilizations and events to demand their freedom. Samidoun emphasizes that the Israeli occupation is fully responsible for the lives and health of the strikers. We cannot wait until these brave strugglers are facing death to act and demand not only their freedom as individuals, but the abolition of administrative detention – on the road to freeing every Palestinian prisoner held in Israeli occupation jails. It is not the case that Israeli military courts are any more legitimate, fair or acceptable than administrative detention – they are just as arbitrary, racist and illegitimate. But administrative detention is a weapon of mass terror used against the Palestinian people, and it is critical to bring this practice to an end. These Palestinian prisoners have put their bodies on the line in order to end administrative detention – and it is imperative that we act to support them. These prisoners’ struggle is not only about their individual freedom – it is part of their struggle for return and liberation for Palestine. 5. Contact political officials in your country – members of Parliament or Congress, or the Ministry/Department of Foreign Affairs or State – and demand that they cut aid and relations with Israel on the basis of its apartheid practices, its practice of colonialism, and its numerous violations of Palestinian rights including the systematic practice of administrative detention. 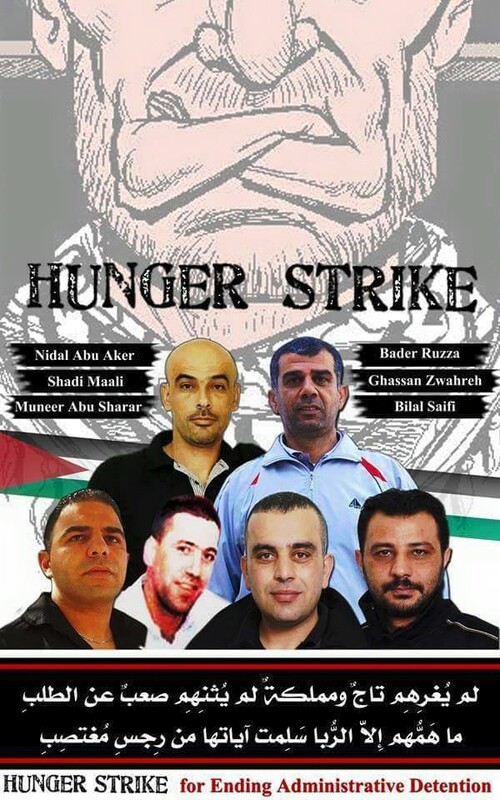 Demand they pressure Israel to free the hunger strikers and end administrative detention. 6. Boycott, Divest and Sanction. Hold Israel accountable for its violations of international law. Don’t buy Israeli goods, and campaign to end investments in corporations that profit from the occupation. G4S, a global security corporation, is heavily involved in providing services to Israeli prisons that jail Palestinian political prisoners – there is a global call to boycott it. Palestinian political prisoners have issued a specific call urging action on G4S. Learn more about BDS at bdsmovement.net.